A funny thing happened just the other day. I was sitting in my car, in a queue for petrol at my local garage and I was watching a woman take her old Rover through an automated car wash. 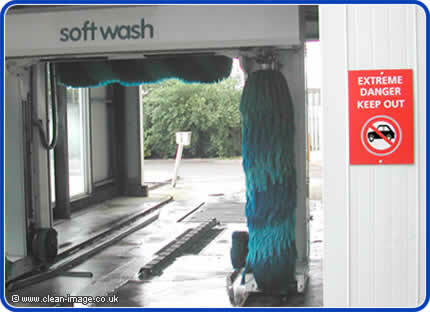 I was just thinking that it was high time that I wrote an article about automated car washes and the damage they can do to your car, when there was a loud bang... then a grinding noise followed by some scraping sounds. The lady managed to free her car from the car wash and as she inspected the damage, I rushed up to the scene. I was about to say "Excuse me, I am writing an article on the dangers of automated car washes..." when it struck me that the coincidence was so bizarre that she probably wouldn't believe me and think that I was just some weirdo with a car wash fetish (I haven't, I'm just shy and maybe a little paranoid). I didn't have my camera with me and I frantically searched my car for any leaflets or brochures that I could give her. By this time staff members and the manager had swarmed around the scene like secret service body guards, so I had missed my opportunity to invite the lady to contribute to this article (if anybody else has a bad experience with a car wash, I'd love to hear about it. Maybe if we can get enough people, we can start a support group). While the manager of the garage ushered the woman into an office around the back (I heard him promise her a full refund! ), I inspected the car and the car wash until the filthy looks of the garage staff made me feel so uncomfortable that I had to leave. I'm not quite sure what happened, but it seemed that the top rotating roller had come loose from it's axle and dropped down onto the back of the car, ripping off the rear windscreen wiper which was now in bits on the roof and bonnet. Worse still, the brackets and runners which supported the roller had broken and bent and were protruding from the pillar which housed them. As the car wash had continued to go through it's automated program even after it was broken, these brackets had scraped their way down the the rear quarter of the car causing serious damage to the paint and bodywork. I cursed myself for not having my camera with me and went back the next day to get some photos of the broken car wash but it was fixed and already back in action. Efficient aren't they?